The top feature request for my Aquatic Steam skin was a black version. Rather than go for the native Aqua look, this iteration stays closer to home, and users won’t have to adjust to anything new. I’ve added in the bonus of a tweakable frame color along with other minor changes and fixes. 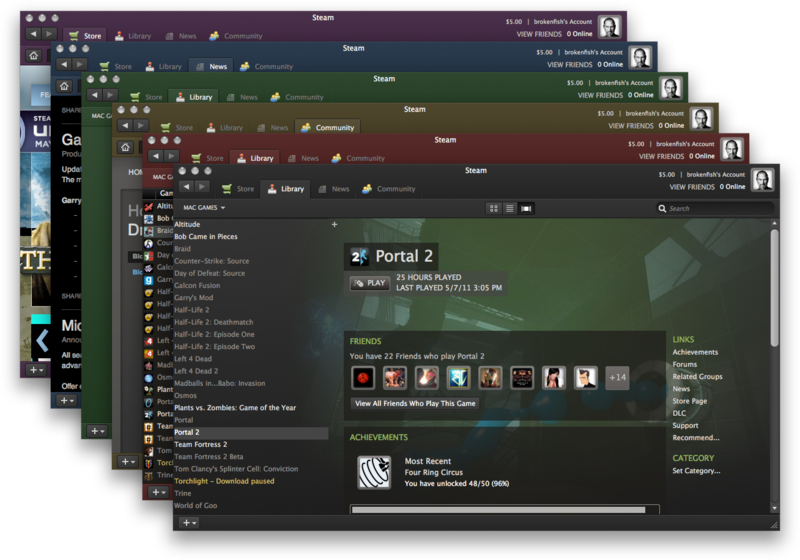 Now you can use a nice Steam skin with a hint of your favorite flavor (color)! You can read the intro post for background information and instructions if you’re interested, but let’s skip straight to the good stuff this time. 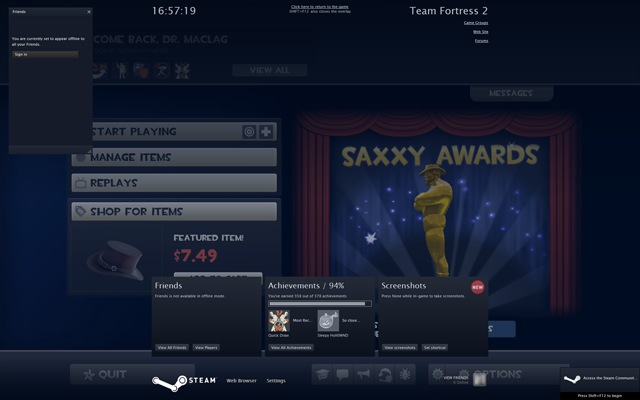 Note: Screenshots are not updated for the Steam Trading update. Most of the other screens just look like black/tinted versions of their previous selves in the experimental build released in August. Installation instructions can be found in the initial release post or readme.txt within the package. Once again I’ve included an iconless edition of the skin for players who prefer an even more minimalist theme. These directions are also listed in readme.txt. Open ‘Aquatic/resource/styles/steam.styles’ in a text editor. overlay = "0 255 0 31"
Page tabs in the in-game overlay may be jogged by 1 pixel in their center portions. This is due to an image scaling issue which I cannot resolve. It sometimes affects Mac and Windows differently. Thanks to the testers who helped me identify issues at various stages. I’ve taken care to adjust pixels for OS X and Windows 7 separately. The default font on the Windows version is also more common, so icons should be lined up from the start. Of course, you can also switch to the better-looking font if you’d like. Non-English users will unfortunately still have offset icons and will need to either use the no-icon version or adjust the icon placement themselves, sorry again. Search box on Friends list was hidden in order to prevent the extra elements from blocking the menu. Thanks to JaTochNietDan for the quick fix. The “E-mail Reminder Bar” has been added in, but remains untested. Inbox icon and menu from the latest client update have been added in. Credit and my gratitude go to Epsilon for taking the initiative. Root window’s web browser Stop button should be aligned with the other buttons now. 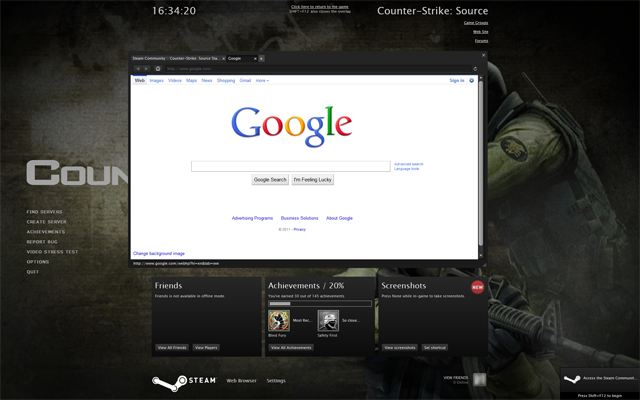 Web browser’s ‘Find Bar’ (Ctrl + F / Cmd + F) functionality has been implemented. New menu items have been added in. Scroll bar heights have been re-adjusted to fit snugly in some windows that were thrown off by the beta update. Friends list panel will adjust height properly when avatars are toggled on/off. Pending invitations’ Ignore/Invite links are now properly positioned. Your own name plate no longer has a hover effect (to match default skin’s behavior). Toggling avatars on and off will not change this [current bug in default skin but not Aquatic]. This release is labeled a beta since it’s primarily a bug fix release for the beta client, though there were some cosmetic changes to Friends/Chat. Friends List should work with the beta client. Chat should work with the beta client. The new Friends/Groups panel is now a separate pane within the main Friends List, so it has been darkened like other scroll lists. The date stamp in the file name now uses abbreviated month names instead of a number. Group chat Friends List now stops at the proper height (doesn’t extend through the text box). Scroll bars have been slightly darkened to stand out less. Menu bars have been moved in a little, and the minimize/maximize|restore/close buttons were rearranged in familiar Windows fashion on the non-Mac version of the skin. Chat window text fields are now 2.5 lines tall instead of 1. Font size in certain places has been increased. The “Send” button on chat windows has been removed. Reload and stop buttons of the URL bar are now styled like other buttons and placed next to the home button rather than on the right side like in IE and Safari. The in-game overlay has received a significant overhaul. In addition to the achievement and screenshot panels getting their backgrounds back on the default scheme, the entire overlay is now gently tinted. The integrated web browser of the in-game overlay has received some cosmetic fixes and fine-tuning. The games list on the Game Detail view now has the same padding as other lists for easy reading even without game icons. Some other small visual adjustments. 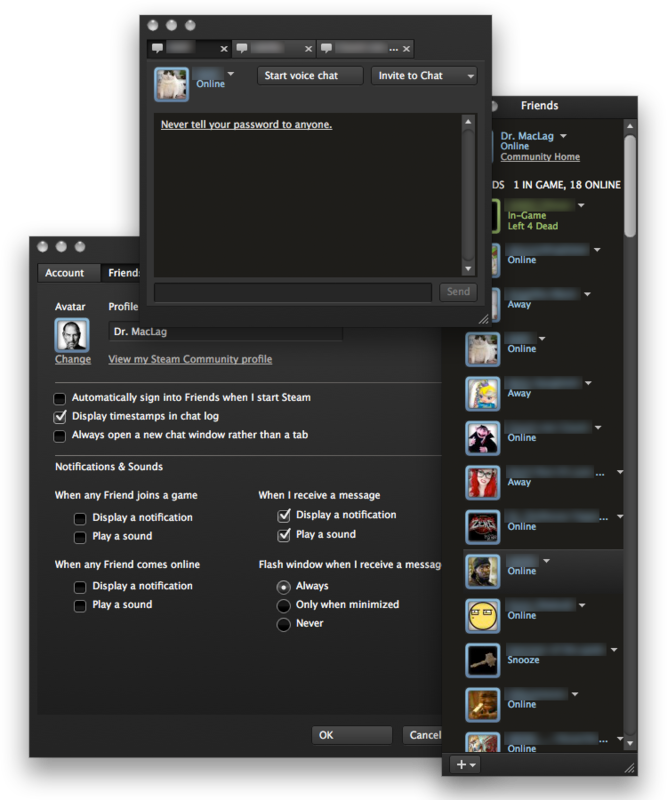 Chat dialogs’ inner panels are now tinted. To avoid the use of images to alleviate color banding, many panels now bear solid-color backgrounds. Hopefully they load faster than normal now, too :). The section headers should be easier to distinguish from the list backgrounds now. 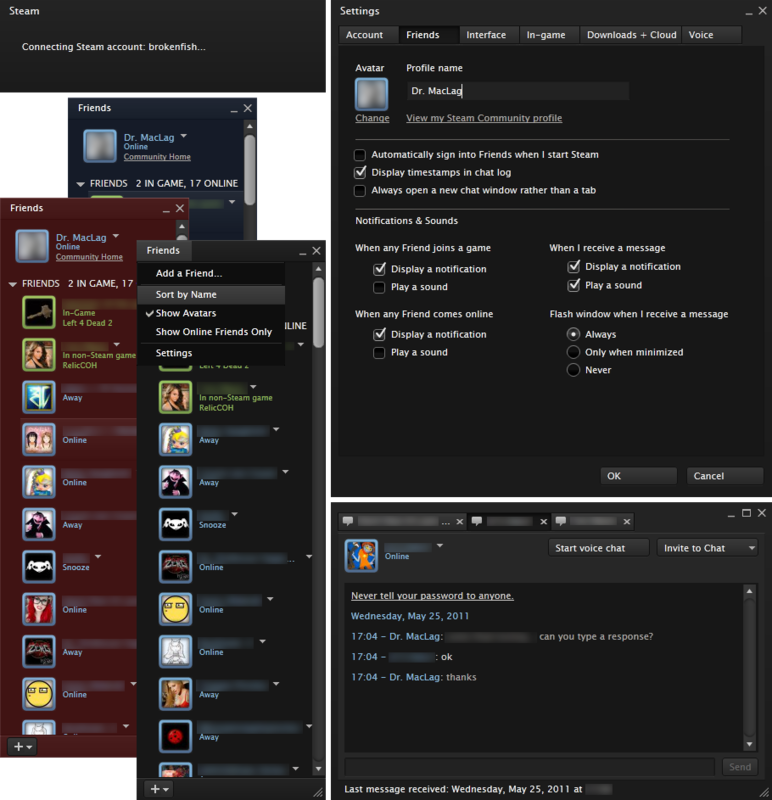 Games List, Game Detail view, page containers, and Friends List now take on the user-specified tint. Game Detail window background is now solid to eliminate banding on certain displays at higher resolutions. The Games List is slightly padded for better readability when not showing game icons. Small Mode is now styled properly. 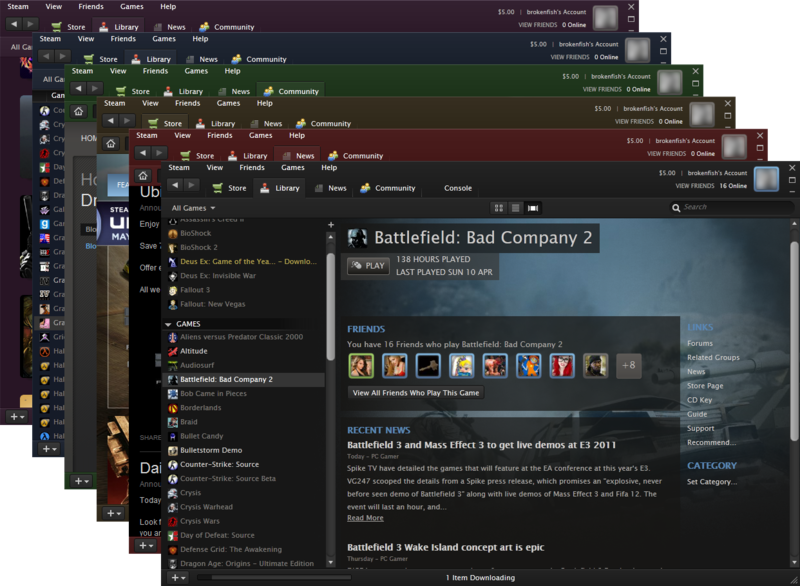 Just a tidbit of information if any skinner is interested: the Mac version of Steam is better at scaling images. For some reason, the Windows version would sometimes – yes, sometimes, but not every time – cut off 1 pixel at the bottom of images told to scale horizontally but not vertically. Since I took a mainly image-based approach to Aquatic 1.0, this extremely frustrating problem was exposed when I began testing on Windows. Other than that, there weren’t any major roadblocks, and the revised style is indeed slightly cleaner than before. As planned, the overlay and notifications weren’t really affected this time, but they do take on the hint of color you can specify. For extended discussion you can visit Aquatic’s thread at the Steam forums or the original blog post. Unlike the 0.1 release last week, this version is more or less final. No major changes are planned, and minor updates will primarily be for bug fixes, if any. Go ahead and make modifications to this skin, but as always, please give credit where it’s due. Love the skin, but got 1 problem, i cant see my freinds on steam :S ..
Are you sure you’re using the proper version of the skin? Like Seppe above, you should revert to the older version if you’re not opted into the Steam beta client.